Charles "Charlie" Tahan (born June 11, 1998) is an American actor. His notable roles include Wyatt Langmore in the Netflix original crime drama Ozark (2017-present), the voice of Victor Frankenstein in the Disney 3D stop-motion-animated fantasy horror comedy Frankenweenie (2012), Ben Burke in the Fox dystopian mystery thriller series Wayward Pines (2015–2016) and the young Jonathan Crane / Scarecrow in the Fox/DC Comics superhero drama Gotham (2015-2017). Glen Rock, New Jersey, U.S.
Tahan was born and raised in Glen Rock, New Jersey, where he attended Glen Rock High School. He is the middle of three children with an older brother, Willie and a younger sister, actress Daisy Tahan. Tahan played Ethan in the post-apocalyptic science fiction horror film I Am Legend (2007) and appeared in the horror film Burning Bright (2010), Tahan co-starred with Zac Efron in the drama Charlie St. Cloud (2010), based on Ben Sherwood's 2004 novel The Death and Life of Charlie St. Cloud. He also voiced Victor Frankenstein in the Disney 3D stop-motion-animated fantasy horror comedy Frankenweenie (2012), directed by Tim Burton. In 2010, he had a recurring role as Calvin Arliss in the twelfth season of the NBC police procedural drama Law & Order: Special Victims Unit. In 2009, Tahan co-starred as William Woolf in the drama The Other Woman with Scott Cohen and Natalie Portman. In 2015, Tahan had a recurring role in two episodes of the first season of the Fox superhero drama Gotham. 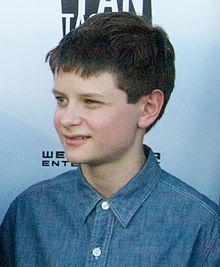 He played a young Dr. Jonathan Crane. In 2017, he returned to the show early in the fourth season until the role was recast to David W. Thompson. From 2015 to 2016, he starred as Ben Burke in the Fox dystopian mystery thriller series Wayward Pines created by M. Night Shyamalan. Charlie St. Cloud Samuel "Sam" St. Cloud Chris Massoglia plays an older Sam in an alternate ending. ^ "2014 Sundance "Trading Cards" Series: #15. Charlie Tahan (Love is Strange)". ioncinema.com. January 16, 2014. Retrieved February 24, 2015. ^ Sarah Jeffery [@sarahmjeffery3] (June 12, 2014). "@ellentahan @charlietahan I doubt he'll see this tweet soon, so please tell Charlie I say happy 16th! Hope all is well!" (Tweet). Retrieved February 24, 2015 – via Twitter. ^ "The Indiewire Springboard: How 16-Year-Old 'Love Is Strange' Standout Charlie Tahan Stays Grounded". indiewire.com. August 22, 2014. Retrieved February 24, 2015. ^ Rohan, Virginia. "Glen Rock's Charlie Tahan stars in Fox's Wayward Pines", The Record (Bergen County), June 9, 2015, backed up by the Internet Archive as of October 21, 2016. Accessed August 30, 2018. "'People kind of always assume that if you're a child actor, you don't have friends or anything, but I've never experienced that really,' says Tahan, who is finishing his junior year at Glen Rock High School." ^ "Meet Charlie Tahan of 'Charlie St. Cloud'". Archived from the original on August 4, 2010. Retrieved September 18, 2012. ^ Kissell, Rick (December 9, 2014). "'Wayward Pines' Event Series to Premiere in May on Fox". Variety. Retrieved February 7, 2015. ^ Kroll, Justin (October 21, 2009). "Players". Daily Variety. Retrieved July 17, 2010. ^ Memberto, Brad (October 30, 2009). "Cirque du Freak: Not Your Father's Vampires". Santa Ynez Valley News. Retrieved July 17, 2010.